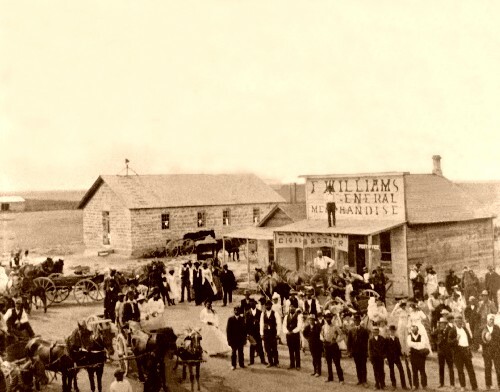 Nicodemus, Kansas was founded in 1877 at the end of the Reconstruction Period. It soon became one of the most famous mostly black communities in the country formed by freedpeople migrating west. Nicodemus is located on the plains in the northwest corner of the state along the Solomon River in Kansas. The six founders, W. H. Smith, Benjamin Carr, Jerry Allsap, the Reverend Simon Roundtree, Jeff Lenze, and William Edmonds, all from Lexington, Kentucky, named the town Nicodemus after a legendary African slave prince who had purchased his freedom. They envisioned Nicodemus as a place where its settlers would have both political freedom and economic opportunity. Nicodemus’s most prominent citizen, Edwin P. McCabe, arrived 1878. McCabe served the community as an attorney, land agent, and later county clerk. In 1882 he became the highest-ranking African American elected official outside the South when he was elected the state auditor of Kansas. Legends of America: Legends of Kansas-Nicodemus-A Black Pioneer Town, http://www.legendsofamerica.com/OZ-Nicodemus.html.